Electric drive is a double blessing: it will enable Porsche to meet stricter fuel consumption and emission standards in future. At the same time it improves vehicle performance considerably. Doing one thing without neglecting the other – that sums up the Porsche philosophy pretty well. From classic sports cars to four-door vehicles – all models from Zuffenhausen and Leipzig reconcile seeming opposites. This is a key aspect of the brand's core values. When it comes to the subject of electrification there is a particular focus on the opposites innovation/tradition and performance/everyday practicality. With regard to innovation, the sports car manufacturer demonstrates its outstanding engineering time and again with every new model generation. Against the background of several independent studies which say that the market share of vehicles powered partially and fully by electricity will exceed that of vehicles with combustion engines in the next 15 to 25 years, Porsche is investing in its future in this area. As early as 2010 the company was one of the first premium manufacturers to introduce a hybrid model on the market – the Cayenne S Hybrid. 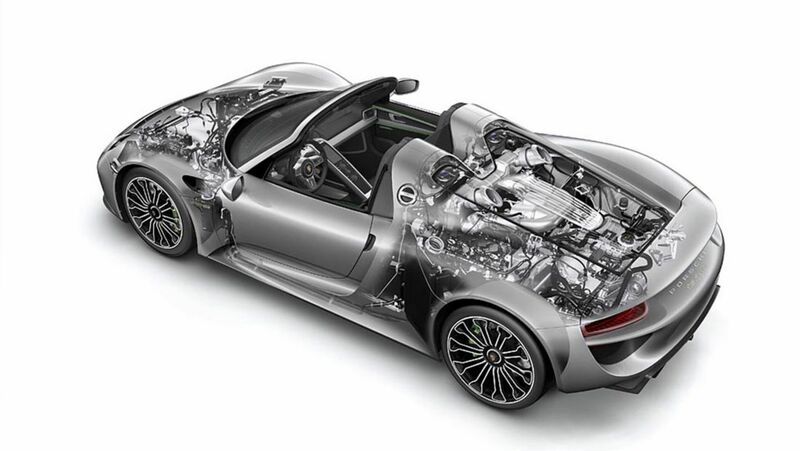 Plug-in hybrid versions followed as the next evolutionary step, led by the 918 Spyder super sports car. “This is the best example of how plug-in hybrid drives hugely increase driving dynamics and driving pleasure with the additional power and increased torque of the electric motor”, says Dr Stefan Weckbach, Head of the BEV model series (GB). After all, both have a tradition at Porsche. To bring the figures to mind once again: system power of 887 hp, acceleration from 0 to 100 km/h in 2.6 seconds, average fuel consumption 3.1 l/100 km, electrical energy consumption 12.7 kWh/100 km. Performance through and through! This shows why Porsche is focusing on the combination of electric motors and combustion engines: it takes the company principle “High performance, low consumption” to a new level. The Cayenne and the Panamera S E-Hybrid respectively demonstrate that this claim applies equally to SUVs and luxury saloons. Compared with their predecessor models they have raised the bar in terms of both handling performance and everyday practicality. Power output of 416 hp (Cayenne S E-Hybrid: Combined fuel consumption: 3,4 l/100 km; CO2 emissions: 79 g/km; Electricity consumption: 20.8 kWh/100 km; Panamera S E-Hybrid: Combined fuel consumption: 3,1 l/100 km; CO2 emissions: 71 g/km; Electricity consumption: 16,2 kWh/100 km) coupled with fuel consumption of just over three litres per 100 km and an all-electric range of up to 36 kilometres speak for themselves. And against other alternative drives: “It goes without saying that in view of ever stricter fuel consumption and emission regulations we have been working intensively on the question of the most suitable drive for some time. In the course of this we examined all possible alternatives in depth and came to the conclusion that only electrification meets our standards,” says Matthias Kirchgässner, Project Manager Sales and Marketing BEV model series (GBV). At the most recent International Motor Show in Frankfurt the concept vehicle Mission E impressively demonstrated what the next step could be in the coming five years. The concept vehicle promises an impressive array of technical innovations with a particular focus on criteria decisive to the acceptance of an electric vehicle such as range and charging time. “When Porsche introduces an electric vehicle on the market it must be able to handle long distances. Our premium standards also mean that models with electric drive must not entail any limitations for customers”, says Kirchgässner. Translated to the road this means a range of at least 500 kilometres and a charging time that is as short as possible. To achieve this aim, Porsche is doubling the charge voltage that is standard today to 800 volts. True pioneer work involving numerous clever technical innovations. For example, lighter copper cables with a smaller cross-section are used – with advantages for both the vehicle and the charging. The reduced weight benefits the range. The faster flow of energy enabled by the innovative cable shortens the charging times. After a good 15 minutes the Mission E has enough energy for around 400 kilometres. This means that customers wouldn't need to stop at a filling or charging station for daily short journeys to work, kindergarten or shopping trips. “We are working on the assumption that more than 90 per cent of the charging processes would take place at home”, Hess says. Porsche is therefore pursuing a double strategy: the company is joining forces with representatives from politics, suppliers and other manufacturers in the area of fast motorway charging to ensure a nationwide infrastructure – with 800 volt quick-charging stations. Because once Porsche has done the groundwork, sooner or later the system will also become established among other suppliers on account of its advantages. In addition, the charging stations are downward-compatible, i.e. electric vehicles with 400 volt drives can also charge there. To make the charging process at home as convenient as possible, the battery in the Mission E can absorb energy inductively. You just need to park over a coil fitted in the garage floor which then transmits the electricity wirelessly to its counterpart in the floor of the car. Although this might take a little longer, it is done virtually automatically overnight. “Furthermore, we are pursuing a holistic approach”, Hess adds. “In future, charging should be fast, convenient, safe, CO2-neutral and at optimal cost.” This includes a combination with renewable energies such as solar cells on the roof of the house or intelligent charging – i.e. always recharging when electricity is cheapest. In contrast to the inductive process, Hess says that quick charging processes put a greater strain on the battery, but all components are designed to last the life of the vehicle – and that's certainly a long time at Porsche. As Matthias Müller, Chairman of the Executive Board at that time, announced during the presentation of the Mission E in Frankfurt, the production version of the car can be expected in a good five years’ time. In the meantime the Porsche developers will continue to accelerate the progress of electrification. This means that in addition to the Cayenne and Panamera there could conceivably be further plug-in hybrid versions in other model series. Because for maximum performance combined with maximum efficiency there is no alternative to electrification. Dirk Lappe on future mobility concepts, digitization and electric driving pleasure.